The holiday season is upon us! For many, Christmas is the highlight of the year. It offers a time to celebrate love, faith, and the bond people share with each other. 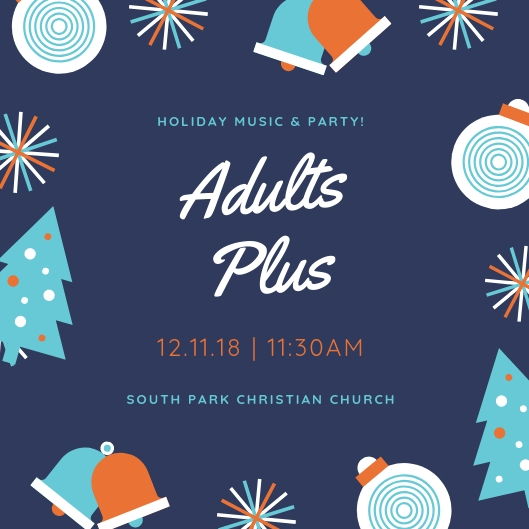 We invite you to join us as we celebrate this season with a delicious lunch, fun activities, and lots of the holiday music that holds a special place in our hearts and memories. Please click here to email your RSVP or call the church office to make your reservation. Deadline for a count to the caterer is Thursday, Dec. 6. We will be meeting at South Park Christian Church, located at 6650 Park S Dr. Charlotte, NC, We look forward to seeing you there!